Q1: Is it safe to burn coal underground and won’t it results in uncontrolled coal fires? UCG is not a well-known mining technology in South Africa, and although it has been in existence worldwide for decades and Eskom has operated a UCG mine at Majuba since 2007, people may still feel concerned about its effect or require more information as to the safe and environmentally friendly operation of a UCG mine. Below, we will try to answer and discuss some of the most common concerns or questions about UCG technology. Q2: How is the UCG process sealed off from the surface? Q3: How will the local communities benefit from UCG? Q4: What can be done if things go wrong? Q7: What does the word “UCG” stand for? Q8: What are the environmental risks? Q9: What is the impact on animals and plants in the area? Q10: What happens above ground? Q11: Could the ground cave in once the coal has burned? Q12: How long would it take to gasify the coal in a radius of 1 kilometre? Q13: Can this technology be combined with CO2Capture and Storage (CCS) and can it affect climate change? Q14: What is the commercial history of UCG? Q15: Who else is developing this technology in South Africa? Q16: Is UCG an efficient mining process? Q17: How much coal is going to be consumed? Q18: How does gas produce electricity? Q19: How is the process ignited or started? Q20: Once the coal is lit, does it continue burning forever? How do you control the process? Q22: How does the country benefit? What business opportunities are there? Q23: What about social and labour commitments? Q24: Is the community going to be safe? Will they need to move? Q25: Will this technology change the price of electricity? Q26: Will the gasifier and the surface be rehabilitated? 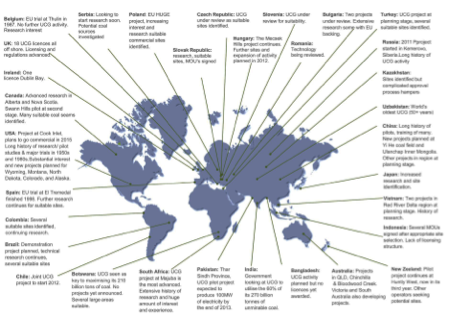 Q27: Where else in the world is UCG being implemented? Yes, because uncontrolled coal fires are a risk only when coal is ignited and has free access to air. UCG takes place in deep, undisturbed coal seams, only connected to the surface by small boreholes for the injection and removal of air and gas. The process is completely sealed from the surface by the geological strata above and interruption of the air/oxygen supply will stop the process completely, therefore, there is no possibility that an uncontrolled fire could arise with modern UCG technology. Uncontrolled coal fires are only a risk when the coal seam is less than 60 meters deep. For this and various other reasons UCG should only be done in coal seams deeper than 100 meters. At this depth, the UCG process operates under the water table and there is a slow and constant influx of water into the gasifier. Africary’s UCG site is more than 300m deep and well outside the possibility of an uncontrolled coal fire occurring. As most people know, you need three things to make a fire: Fuel, Oxygen and Heat. A fire needs oxygen and unless the UCG operator pumps air underground there is no oxygen available to sustain a fire. Secondly, if the gasification process is stopped the influx if groundwater would douse the burning coal and flood the underground cavity preventing any fire. The process is completely sealed from the surface by thick rock layers of more than 300m and permeated with groundwater. The process is only connected to the surface by small boreholes specially designed according to international oil and gas field standards (to withstand both high temperature and pressure) and constructed in such a manner as to provide a leak-proof seal. Although not common in South Africa, this technology is well proven and widely used internationally. Energy extraction from coal usually brings employment to the local population during construction. The UCG production station and small power plant project currently planned by Africary will employ 10 to 15 people on a permanent basis. Apart from the jobs created by the project, the UCG process should attract other industries to maintain and service operations, which in turn bring expertise, training and secondary opportunities. However, the electricity that we will produce has potential for economic activity and well-being that far exceeds the jobs created by our small power plant. As the UCG reactor is confined to the coal, the reaction process is much easier to control. Shutting down a reactor is by simply removing the air (oxygen), which is under the control of the operator, and allowing the cavity to flood with ground water. The best cure is prevention and therefore the Africary facility is designed for full Environmental Impact Assessment and OSHA compliance as required by South African law. Any plant malfunctions, safety or environmental impacts are anticipated and fully addressed in the design of the plant. Learning’s from past experiences and similar designs are incorporated into the plant and is continuously updated to ensure safe operations at all times. There are strict regulations to ensure that the underground and above ground emissions are maintained within legally prescribed levels in a safe and non-polluting condition at all times. The regulations for industrial plants, groundwater and health and safety are extremely rigorous and Africary has implemented all requirements into the design of the plant. As with all underground coal mining processes, it is possible that subsidence could occur due to the cavity created by the partial extraction of the coal seam. However, as UCG only extract the hydrocarbons from the coal rock all the ash remains underground partially filling the cavity and from empirical data and geo-mechanical models we can accurately predict and control the degree of subsidence. Africary’s UCG site is more than 300m deep and far away from any possible damage to surface infrastructure. A preliminary subsidence calculation has indicated it to be as little as a few centimetres. Another concern is that water may flow from the cavity and contaminate the groundwater surrounding the cavity. This potential issue is however easy to solve as the mine is operated at a lower pressure than the surrounding hydro-static pressure. This ensures that groundwater flow towards the cavity rather than out. Africary carefully manages the operating pressure, so water will constantly flow into the cavity without flooding it, and no water is allowed to move from the mine area into the surrounding groundwater. Water is also necessary for the UCG process (as it is the source for the Hydrogen atoms needed to form syngas). All the water flowing into the cavity is consumed in the UCG process and exits the cavity through the production well to the surface as part of the syngas. UCG is an acronym for Underground Coal Gasification, an advanced clean coal technology for directly converting coal in the ground (typically called, “in situ”, which means “where it is underground”) into gas energy. UCG is a chemical mining process. A matrix of boreholes are drilled into the coal seam utilizing sealed wells or more commonly called boreholes. The coal is ignited using specialised techniques and air is pumped into the injection wells to keep the process going. Oxygen /air are essentially used to “mine” the coal, and produce syngas which can be used directly as a fuel for power generation. This process avoids the need for traditional coal mining, transportation, preparation, boilers and the disposal of ash. Optimising the whole process from coal-in-the-ground to electricity-in-the-grid on a single site has various cost, labour and environmental benefits. The environmental impacts of an Underground Coal Gasification (UCG) process are mainly air emissions and groundwater effects. Like any mining process, the geological and hydrogeological extraction risks of UCG have to be carefully managed. Process control has advanced considerably since the early UCG trials and the Africary UCG processes have active control of the operational conditions in the cavity to ensure an inward flow of groundwater and to prevent gas seepage. The contaminant risk and product gas quality from potential UCG sites is fully assessed in advance and would be monitored during and after operations. A wide range of risk management techniques and management tools from around the world are employed for regulatory purposes as per current Africary operating specifications and procedures. The UCG process does require a high temperature to gasify the coal deep underground. However, the Theunissen coal seam is over 300 metres deep and no effect will be noticed on surface. The ground is allowed to subside (as it would in any underground mining operation), however, the subsidence is monitored and modelled, and it is expected to be gradual and only a few centimetres per annum. It is unlikely that animals or plants on the surface will be affected at all. The surface installation above the coal seam consists of water handling, gas clean-up equipment and a small gas turbine power generator and drilling rigs; all of which are removed when the coal seam below is exhausted. The life of a typical UCG production station is approximately five years. The production wellheads are connected by pipeline for onward transmission to a power station, which can potentially be situated many kilometres away from the UCG production station. The inherent environmental benefits of UCG are the simplicity of surface operations, the absence of coal storage and transportation, and the easy removal of minor polluting constituents from the production syngas. The coal seam is accessed by drilling small boreholes from surface, which supply the air (oxygen) and allow the gasification products to reach the surface. Africary will only be incorporate UCG under open fields where this impact will be negligible if any subsidence occurred. The coal seam is over 300 metres underground and the coal seam is less than 3.5 metres thick. The coal itself contains some 30% incombustible materials (ash), which remains behind after the UCG process is complete. The net result on the surface is moderate and gradual subsidence of a few centimetres (if subsidence at surface happens at all). In the case of the Theunissen coalfield, a 1km radius would contain 10 million tonnes of coal, which should be sufficient for the Africary 50 MW power station for a 40 year lifetime. Power generation with the combined UCG-IGCC (Integrated Gasification Combined Cycle) is classified as an advanced clean coal technology, with far lower greenhouse gas emissions, NOx (nitrous oxides), SOx (sulphur oxides) and particulate matter emissions than present commercially available coal technologies. The UCG product gases are open to pre-combustion capture, and can benefit from the high concentration and pressure of the carbon dioxide (CO2) in the product gas. Much of the CO2 from UCG can be captured and therefore UCG is deemed as a CCS ready technology. It is also calculated that a dry cooled UCG-IGCC will achieve far lower water consumption than for an equivalently sized conventional dry cooled sub-critical pulverised coal plant with flue gas desulphurisation. The concept of the technology is more than 150 years old, but up to now has mainly been implemented commercially in the countries of the former Soviet Union. Africary saw the potential, and decided to conduct a pre-feasibility study. This has now expanded into a commercial demonstration project, as the UCG process has proved itself successful at Eskom’s Majuba UCG plant. In the year 1868, Sir William Siemens was, apparently, the first to suggest the underground gasification of waste and slack coal, in a mine. The first patent were claimed to be registered in 1903 by an American, but the first experimental work only started in the year 1912, in Durham (UK) under the leadership of William Ramsey. However, he was unable to complete this work before the beginning of were discontinued to the end of the Second World War. Underground Coal Gasification (UCG) first reached commercial stage in 1945 in the Former Soviet Union with three sites running over 45 years. The Former Soviet Union still has large UCG operations supplying gas to power stations. In the 1950’s, Britain embarked on its own long-term trial in shallow coal seams at Newman Spinney, Derbyshire, and although gasification was successful, the National Coal Board later abandoned the project for economic reasons. US trials in the 1970s proved the value of new technology from the oil and gas industry to control the process. These were followed up in Europe by studies which concluded that the process was technically feasible in the thinner and deeper coal seams of Western Europe. This led to the European trial of UCG in deep seams, which took place in Spain between 1992 and 1999 and then Australia with UCG trials at Chinchilla Bloodwood Creek and Kingaroy (1999 to date). India and China and more recently Canada and New Zealand also recognize the potential of UCG as a national energy option. An Eskom UCG pilot plant has run successfully since 20th January 2007. According to Eskom, they are undertaking a staged development, with each phase dependent on the success of the former stage. Recently, Eskom announced that they would be taking the technology to the next level in a joint venture with Sasol and Exxaro announced in 2013 its development of a major UCG project. As a mining process, it is the most efficient underground mining technology available in terms of coal extraction. In the Majuba coalfield, the pilot plant is reported to have achieved up to 83% extraction rates, whereas conventional mining would typically not achieve more than 25% extraction due to the geology. The Africary design consumes 35 tons of coal per hour. Electricity is produced by a generator. The generator must be driven by some type of engine, or by steam under pressure. The most common engine used is very similar to a jet engine (or turbine) and has some of the best fuel efficiencies of all types of engines. The syngas from UCG is the fuel that is used in the engine. This is usually a proprietary part of the technology, but essentially ignition requires air, heat and a fuel. An ignition well is used as a dedicated borehole in which hot air is blown to dry and heat the coal until it ignites. No – the process requires fuel, heat and air. The coal seam is naturally under the water table, so the only air available is that which is introduced into the coal seam from the surface. The process is controlled by pumping air into the boreholes and without air continuously injected into the gasifier, the process cannot continue. Although both require a coal seam to be drilled from surface and produces a gas, Underground Coal Gasification (UCG) and Coal Bed Methane (CBM) are two very different processes. CBM (aka Coal Seam Gas – SCG) is the removal of the methane from the pores of the coal by removing the groundwater pressure above the coal. This is achieved by pumping large quantities of groundwater from the immediate aquifer above the coal seam. CBM requires fracking (the injection of sand and chemicals to keep open fractures as conduits) to increase the production of gas. The coal itself is left in place, but may be damaged by fracking. UCG is the mining of the coal itself by converting it chemically with air to a usable syngas consisting of nitrogen (N2), hydrogen (H2), carbon monoxide (CO) and methane (CH4). The conversion is achieved by introducing air with oxygen (O2) and into the seam, and gasifying the coal. No injection of sand and chemicals to keep open fractures as conduits is required as the process naturally makes an open channel or cavity between the injection and production well. Furthermore the underground water is maintained as closely as possible in equilibrium. Apart from the new jobs, there will be opportunities for new suppliers, and partnerships. In addition, the threats of power cuts, blackouts (load shedding) and economic slowdown are reduced because of the extra power that will flow into the Eskom grid. As required by the Minerals and Petroleum Resources Development Act (2004), there will be comprehensive social commitment focusing on particularly the local community. All of the foreseeable developments are taking place on the Palmietkuilspruit farms very far away from any existing towns or settlements. Irrespective, the plant will be designed to the highest standards, to ensure safety and the mine plan will take cognisance of existing communities, structures, and archaeological and historical sites. This is part of the extensive Environmental Impact Assessment which is conducted by an independent specialist organisation. Yes, cost effective mining of a gas fuel will open the door for implementation of gas turbine combined cycle plants, which have a lower capital cost than conventional coal plants. Once this demonstration plant proves the commercial ability any future larger plant built to economies of scale should be cost competitive with equivalent new built conventional power stations. The UCG gasifier will be flushed with clean water when it has ceased production. Surface pipes and wells are all temporary, and will be dismantled. The wells will then be cemented closed and cut off below surface, except for monitoring wells which are used to monitor the condition of the water in the dormant gasifier.